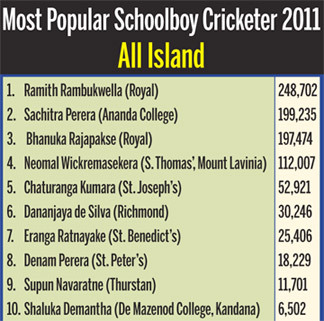 Ramith Rambukwella of Royal Colelge, Colombo won the Most Popular Schoolboy Cricketer of the Year - All-Island contest with 248,702 votes. 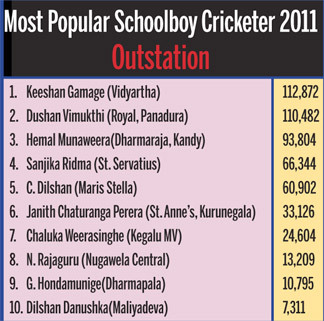 Keeshan Gamage - Vidyartha Colelge, Kandy - the Most Popular Outsation Schoolboy Cricketer of the Year. Received 112,872 votes. 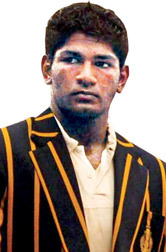 Royal College captain Ramith Rambukwella the ultimate winner of the Most Popular Schoolboy Cricketer of the Year 2011 (All-Island) received 248,702 votes and the second and third place competitors Sachitra Perera (Ananda) and Bhanuka Rajapakse (Royal) also came close to the 200,000 vote mark - Perera got 199,235 votes in coming second and Rajapakse got 197,474 votes in coming third. The 2009 winner of the contest Dinesh Chandimal first represented the country at the World T20 Championship held in the West Indies last year, soon after he was crowned as the Schoolboy Cricketer 2009. 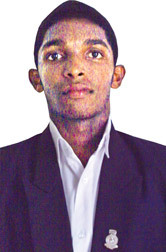 The former Ananda College cricketer is the latest addition to the distinguished schoolboy cricketer list, who within the space of two years has reached the required standard of being on the verge of representing the country at Test level if selected for the first cricket Test against England next Thursday . The competition this year has been a right Royal battle, the two Colombo Royalists Ramith Rambukwella and Bhanuka Rajapakse and the Panadura Royalist Dushan Vimukthi have been in the contest from the first coupon published this year. They have always been among the top three at some time or other and the support rendered to these players have been excellent by the cricket loving public. 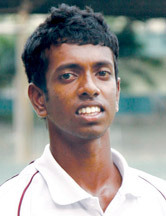 Sachithra Perera of Ananda Colelge, Colombo became the runner-up in the Most Popular Schoolboy Cricketer of the Year - All-Island with 199,235 votes. 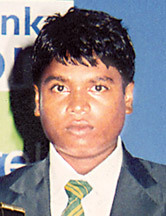 Dushan Vimukthi of Royal, Panadura - the runner-up in the Outstation Schoolboy Cricketer 2011. Ramith Rambukwella, a sturdy lad who represented the Sri Lanka Under-19 team on the tour of England led by colleague Bhanuka Rajapakse. These two players need to be watched for the future. Rambukwella although missing a good part of the school cricket season due to his commitment with the Sri Lanka Under-19 team, fared well in the fewer number of school matches. On the other hand, Bhanuka Rajapakse who became the Schoolboy Cricketer of the Year last year (2010), did not live upto expectations during the school cricket season, but fared very impressively against the England Under-19 team as an all-rounder. Besides taking wickets, he struck two centuries. This year too, there has been some sterling performances with bat and ball. Besides Rambukwella’s efforts, two more players Sachitra Perera (Ananda) completed the school cricket season taking over 100 wickets. He was extremely unlucky not be selected for the Under-19 England tour and the subsequent tour of England to the Island early in the year. Dananjaya de Silva of Richmond College, Galle, is another player who represented the country at youth level and fared exceptionally well. So, the foursome of Rambukwella, Rajapakse, Dananjaya de Silva and Sachitra Perera are undoubtedly the future players for the country and this was quite evident from the voting pattern in this popular contest.